Big news over the weekend. Disney's D23 released images and information regarding the barely confirmed and highly speculated project based around James Cameron's 'Avatar' movie (and it's possible franchise which is also up in the air at the moment). We now have an rough opening date for the project- "The first few months of 2017" and construction will 'fully begin' in 2014. Now I fully admit, this project has little interest to me other then the simple fact of "How pretty can they make it look?". Because honestly, we've all seen the story given to us in the movie 'Avatar' as it exists in other forms. The most notable are "Furn Gully" and "Pocahontas" but the story wasn't the reason you saw that movie, it was the beautiful computer imagery they created. I admit fully I watch it for the effects and visuals on the alien planet of Pandora, I could care less about 9 foot tall blue cat people. It was beautiful, the effects are like nothing I've ever seen. They honestly took my breath away and I'll fully admit I've paused the movie many times just to stare as the scenery. That's the only part of this "Avatarland" project that interests me. Now with it having a projected deadline of "the first few months of 2017" I think we're finally going to see a true test of what Walt Disney Imagineering can do. This isn't going to be nearly as easy as projects in the past, working with James Cameron and bringing the planet to life won't be anything like what Disney has done before. In the past, Disney has only worked with and created attractions/lands their own franchises or with ones which they have a vetted interest in (such as Lucas and Star Wars). As you notice, Star Tours doesn't yet have a huge 'themed land' in Hollywood Studios, just a small area used to mostly hide the sound-stage. In Epcot, they worked with the countries to re-create the feel of the land through already standing historical buildings. As much as I'd like to believe "If anyone can do it, Disney can" I've got some doubts. Disney is great, don't get me wrong, but they've never been very good at 360 degree themeing. To pull off a project like Pandora/Avatarland their going to have to go above and beyond anything they've ever done in the past. All the while with Cameron breathing down their collective necks. I'm really hoping they do pull it off but I don't believe this is going to be the answer they have been searching for. I don't think it's going to be the "Harry Potter Killer" they expect. The movie Avatar didn't grab hearts, it was immersive but non-original. Beautiful to look at but lacking the story to really make it stand the test of time, plus with unknown or fluctuating dates on on the next two movies, I don't believe this is the answer Disney is looking for. However, it does solve a problem in Animal Kingdom. The age-old question of "What do we do with Camp Mickey-Minnie OTHER then put in Beastly Kingdom?". What about rides and shows? Rides is a huge question, one none of us have the answers to right now. However, if you view the picture I posted on the left you'll see what looks suspiciously like what I'm calling "A Pandora Jungle Cruise" style boat ride. This gives me some reservations already. 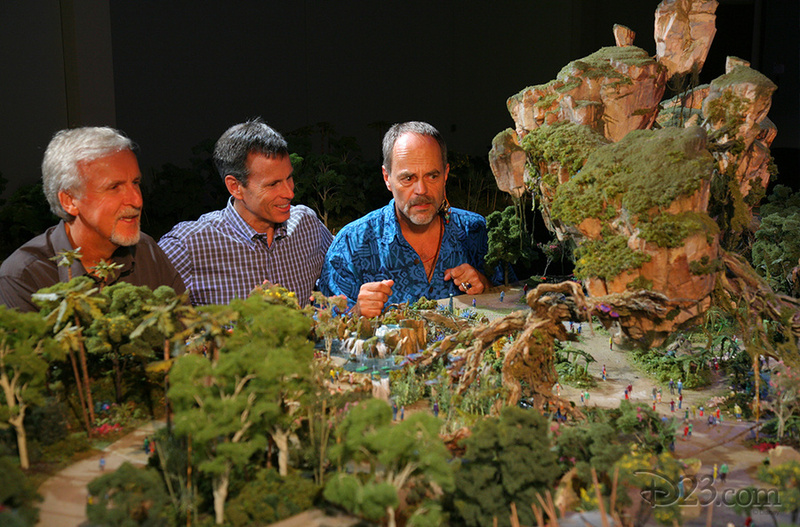 While I'm sure it'll be very pretty to look at we only know a few animals from the rather large planet of Pandora. While I'm sure Cameron will provide plenty of images, no one will know what they are! Can you see the oddness of that? You'll be viewing an alien animal without any concept of reference. From the movies we know some are dangerous while others aren't, if we don't have that reference for new 'animals' a lot is going to be lost on riders. Well, other then "Oh pretty" or "Okay that thing is cool looking". The rest of the attractions are up in the air as no one has any real confirmation but many of us have been speculating about this since the project was announced in 2011. Let me give you the most popular ideas of what other rides we may see in Avatarland. - Some type of "Flyer" or "Flying" attraction. Perhaps something similar to Islands of Adventure's "Peteranodon Flyers" and some speculate even a Vekoma "Flying Dutchman" style coaster (although that second is highly unlikely due to height limits and 'family friendly' issues). - River Cruise. This is all but confirmed by the image above but as fans well know, what we see in concept art doesn't always come true in the end. - Some form of a Na'vi stunt show/theme show. You can't have Avatarland without working in the 9 foot tall blue cat people.. somehow. - Simulator Ride/Tour Pandora? This is the second option for a "flying' or visiting the planet. Another simulator ride similar to Star Tours. In the end, until things are confirmed we're all riding on speculation. While many of us hoped this project would fall to the wayside, it doesn't look like that's going to happen. Not with the money involved and not with a working release date finally being announced. Because of that I think it's time we all let go of the 'Beastly Kingdom' idea and tuck it away into our special bags of "Things to be angry with Disney about...". In the end, I will give Avatarland a fair (if highly critical) chance. Perhaps when more details are reveled, my opinion will change.. but I wouldn't take that to the bank if I were you. Which leaves me with one last question: Will Disney place some silly Pandora animal in the Dragons place on their 'Animal Kingdom' logo?